A new cardboard building kit will let kids drive a car, plane, and submarine. In April 2018, Nintendo launched its first two Nintendo Labo building kits, letting kids and adults work together to build video game controllers -- called Toy-Cons -- out of cardboard, which they could use to play games on the Switch. The Variety Kit contained smaller building projects, like a fishing pole and motorbike handlebars. The Robot Kit let kids create a robot costume they could wear as a backpack. Now, a third kit has been revealed that will let kids embrace their need for speed. 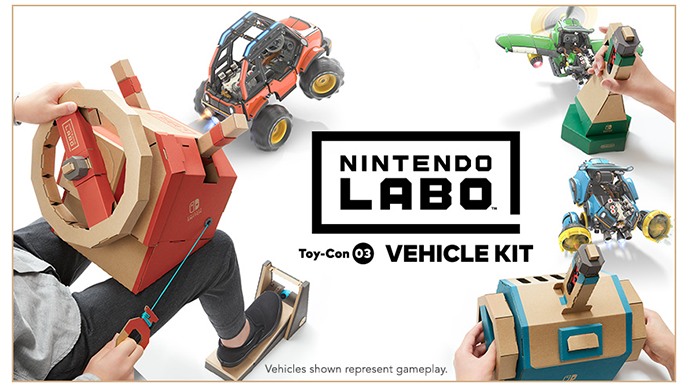 The Nintendo Labo Vehicle Kit will let kids construct a car’s steering wheel, a plane’s flight stick, a submarine control unit, a pedal, two keys, “and more.” The kit will come with its own unique Nintendo Switch video game that lets players use their creations as their controllers while racing, battling in-game cars, and playing other games. Kids can control the game’s vehicles by inserting one of the keys they’ve created into the different cardboard Toy-Cons. The second key lets another player join in on the fun at the same time. Each vehicle will have its own controls and special moves, which players can activate by interacting with the cardboard controller in a specific way. As examples, kids will be able to pop wheelies while driving the car, launch a grappling hook from the submarine, and more. Like the other Nintendo Labo building kits, the Vehicle Kit software will include Toy-Con Garage, a playground of sorts that lets players program their own tools and games that use the cardboard controllers. Players have created some amazing things out of the first two Labo building kits, from original games to beautiful music and beyond. Even if your kids aren’t interested in creating anything from scratch, they can customize the kit’s cardboard pieces using stickers, markers, glitter, and more to make their pieces stand out. The Nintendo Labo Vehicle Kit will launch on September 14 for $69.99. Libe MG Ackerman is the Editorial and Creative Director of SuperParent, and a longtime gaming, digital media and television executive for companies such as Nickelodeon, AOL and Ziff Davis. She can often be found playing Pokemon Go with her son in her Brooklyn neighborhood. Follow her on Twitter: @libeackerman.